SURVIVOR® ATV built by Rice Lake is described as a heavy or extreme duty, top access portable scale. The ATV is rigidly constructed for heavy-duty weighing, yet lightweight and compact for convenient portability. The pre assembled modules – from 10 to 30 feet long – and unique self-seating hinge connectors provide easy installation, expansion and relocation for your growing business. The Rice Lake ATV truck scale boasts more steel, the strongest weighbridge, and higher quality construction for long-lasting durability and performance. Standard end clean out eases debris removal to help maintain scale accuracy. You don’t have to look at too many truck scale brochures to become thoroughly confused about what’s available and what is and isn’t important to you. The Rice Lake RoughDeck® AX heavy capacity floor scale system includes two fully electronic, RoughDeck low profile floor scales, four on/off ramps and two signal trim junction boxes. The RoughDeck AX scale is available in a size of 32 W x 84 L x 6 H ( 81.3 cm x 213.4 cm x 15.2 cm) and each has a capacity of 30,000 lbs (13,608 kg). Once combined with the ramps, the total length is 204″ (518.2 cm). What is concentrated load capacity and ntep? Concentrated Load Capacity, or CLC, is an industry recognized rating of a vehicle or axle load scale. The rating defines the maximum load for which the weighbridge is designed as applied by a group of two axles with a center line spaced 4 feet apart and an axle width 8 feet apart. When a CLC load is applied to the weighbridge during a National Type Evaluation Program test, the NTEP tester records the displayed weight. If the scale falls within accepted testing tolerances, the scale has that CLC weight value recorded as the CLC on the Certificate of Conformance. The CLC rating is not a measure of weighbridge strength or rigidity, because weighbridge deflection is not measured in the NTEP test. It is irrelevant if the load weighbridge sags 1/10th of an inch, or 10 inches, as long as the scale weighs within the accepted tolerance. The scale’s CLC weight rating passes in either case. A high CLC rating could be given to an extremely flexible deck sitting on load cell mounts which are capable of accurately handling the side loading resulting from a severely sagging weighbridge. Cardinal’s 225 Navigator features transflective technology which allows the 225’s display to be viewed under any lighting conditions from direct sunlight to total darkness. One-inch-high (25 mm) weight characters make viewing easy. 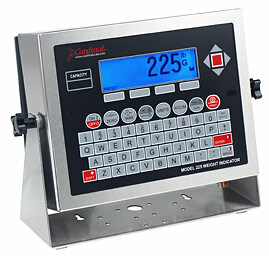 View up to 3 scales with total weight simultaneously with the optional dual scale input board; no special software is needed with Cardinal 225 Navigator digital weight indicator. Entering, viewing, and storing truck names is easy with the 225 Navigator’s convenient Truck ID menu. Complete alphanumeric descriptions for truck and material prompts make storing and recalling tare weight values quick and simple. The heavy capacity series of compression load cells are ideal for multiple load cell compression applications such as motor truck scales, railroad track scales and heavy duty tank weighing systems. 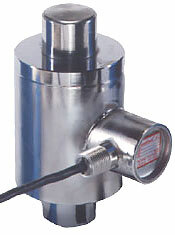 These compression load cells are available in 50K-SCA 22680kg, 100K-SCA 45360 kg and 120K-SCA 54430 kg. Cardinal SCA Truck Scale Load cells are fabricated from stainless steel to provide the ultimate in protection when caustic, corrosive or wet environments are encountered. Load cells are hermetically sealed for absolute water protection (IP68). Each load cell is furnished with stainless steel load buttons on each end, and a 9m integral multiconductor cable secured by a strain relief seal. Steel or Concrete Weighbridge for Truck Scales? The structural integrity of the truck scale weighbridge is the single most important consideration in the purchase of any truck scale. A failing weighbridge results in continuous problems that can only be solved with replacement. Rice Lake Weighing Systems standard model truck scales are comprised of beams spaced no further than 12 inches from center line or 8 inches from the edge of one flange to the next. This design ensures that a truck tire is on an I-beam at all times and never between.